When most people are asked about where energy comes from, the most obvious sources come to mind first. Electrical power comes from a nearby generator plant, and gasoline comes from imported oil. These are the two most common sources of energy most of us know about and think we know where they are generated. However, these two categories do not make up all the energy used in the U.S. The U.S. Environmental Protection Agency, or E.P.A., put together a very fascinating visual display of how energy is brought into the country and how it is consumed performing various functions. 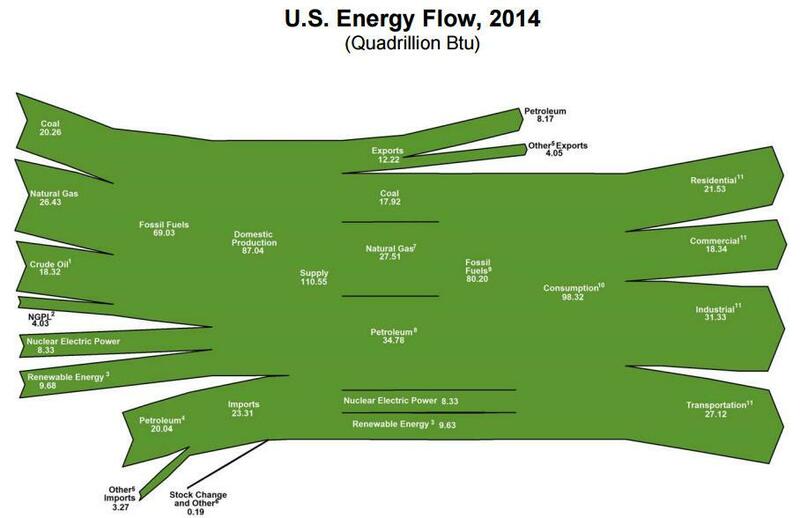 What at first looks like a big green log with split ends is really an informative energy flow map of all the big areas of energy production and consumption. Everytime I look at it, I learn something new. And many common assumptions are very different from reality. For example, foreign oil only represents a little over 23 percent of energy resources available to Americans. And electrical energy generally comes from either coal plants which draw on coal, a natural mineral that provides 20 percent of the country’s energy, or from nuclear electrical energy, representing 10 percent of the total. The large majority of energy resources in the chart are fossil-based materials. And, despite our capability, we are only using 20 percent of our energy supply from renewable or nuclear sources. Interestingly, it is not private homes that are the biggest energy hogs. They only eat up slightly over 21.5 percent. Instead, commercial interests (18 percent), industrial entities (31 percent), and transportation (27 percent) eat up a big portion of available energy. So while the average person can do their part in helping conserve energy at the individual level, it truly is the commercial and industrial arenas that have the biggest impact in energy conservation as well as consumption. Alternatively, if society were to shift away from its reliance on so much individual transportation, that would have a big impact on a fourth of the consumption picture as well, but we’ve been chasing that social goal for decades. Until we can get on par with the quality and safety of public transport in Europe, we will never have the idea of public transit taken seriously in a car-driven society. Coal may seem like a throwback to yesteryear, but it still remains in the top three energy sources. It burns, it’s messy, but it works, making coal remain extremely valuable. Natural gas is gaining more and more of a foothold as new construction takes over various regions. It’s a standard form of heating in new homes and buildings. Nuclear power is the bad child in the energy family because society still carries many of the fears of the 1970s and exploding nuclear centers poisoning regions. In fact, nuclear power today provides far more energy and is chiefly curtailed by regulations and fear. Hydropower is the last of the big sources, but it is often limited to water supply and where the water is located. Hydropower dams have also had more issues with integrity and structural failure than most other energy projects. The remaining categories make up the residual elements, wind being the most notable and growing.